This is probably the nicest Gulf front condo in the Rosemary-Alys Beach area. The premier unit located in the top west corner of the complex. The views are outstanding, overlooking the surf and the sand below. The condo is very spacious and lends itself to complete family enjoyment This is in the far right 'C' building, overlooking the beach; and away from the noise of the pool. and, of course, your families' complete enjoyment! The unit has been upgraded with granite counters in the kitchen and Australian hardwood flooring in the kitchen and living area. There is an flatscreen TV over the fireplace. There has been wainscoting added to the hall and dining area. This spacious unit has a balcony that looks to the west for a never ending sunset panorama. The master bedroom is large with a tub/jacuzzi that sits out into a windowed alcove letting you have direct views to west of the Gulf and the sunset as you enjoy a relaxing bath. There are two completely separate sink areas, one in the bath the other in a vanity for complete independence. There is lots of counter space and a large walk-in closet adjacent. The second bedroom has a bunk bed and trundle bed, cable tv, and its own bath. A third bedroom is off to itself down the hall with a Queen bed, cable tv/vcr, and it's own bath.The laundry room has washer/dryer and ample supplies. No need to carry your belongings to the beach, you already are right there, You can enjoy it all from the balcony! Balcony overlooks beach, Fridge is behind you! No pool noise in front of this building. !!!!!!!!!!! Magnificent views !!!!!! There is NO phone service, Please bring cell phone! Whole House Surround Sound in all rooms and master bath! Another excellent Thanksgiving on 30A. My family of 6 was blessed to stay in this condo for Thanksgiving this year. The view was amazing, the kitchen had everything we needed to prepare out feast, and the kids all slept soundly. We couldn't ask for more. We highly recommend this one. My husband and I along with another couple spent several days at this location. The condo was excellent. Plenty of room for everyone. The view in this place is amazing. Very relaxing. Our contact person, Alan, was very prompt with setting up the reservation and quickly answered any questions we had. We will definitely stay here again. This condo is the best condo on 30A! Everything was very simple from check in to check out. Alan was a pleasure to work with and made sure our stay was perfect. 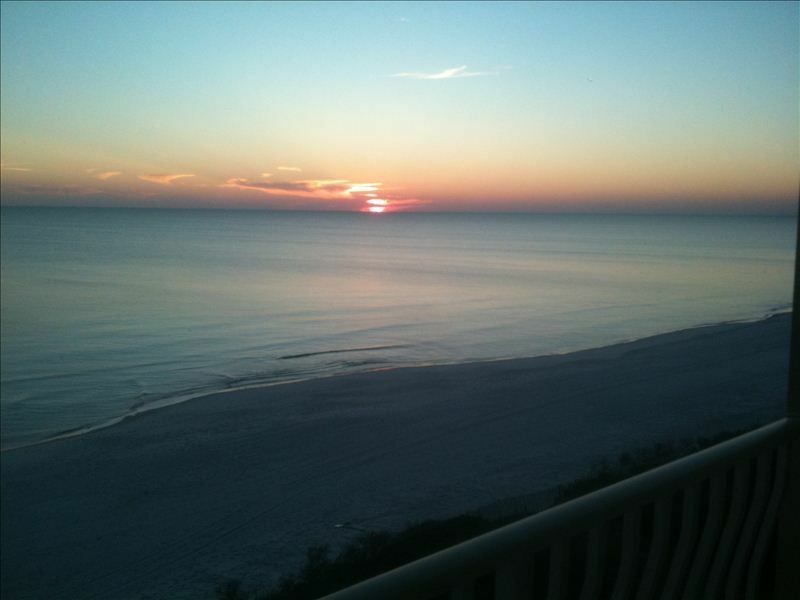 The view from the balcony cannot be beat and provides a beautiful view of sunset. The condo comes equipped with everything one could need at the beach from beach chairs and umbrella to popcorn and waffle maker! This condo is also in a very ideal location with amazing restaurants and shops nearby in both Alys and Rosemary beach. Charlie's Donuts! I definitely recommend staying here and will be back in the future! The unit has a great balcony with gorgeous views of the ocean. It was extremely clean and the main living space is much more beautiful than the pictures can indicate. The owner was extremely responsive in answering all of our questions in advance of our stay. It was a great layout for our group and we very much enjoyed our stay The location is excellent for walking or biking and enjoying all of the restaurants and shopping in Rosemary. We love staying in this beautiful home for the second time this year! Alan is very prompt, responsive, and easy to work with. tremendous view, quiet property, great location. Front door lock was broken, rear knob/lock needs replacing. Notified owner. A $250 non-refundable fee holds reservation at booking. This is non-refundable with cancellation. In addition to the $250 refundable damage deposit, there is a $99 Property Damage Protection fee, this covers the property insurance deductable of $5000. The property will absolutely not be rented without this. Cancellation is completely nonrefundable 60 days prior to reservation. VRBO sells cancellation insurance. A member of the party must be 25 or older. No Pets, No smoking.